With summer now here, more and more HepsNation athletes will be traveling around the world looking for competition. Some of the action this past weekend may mark the end of a long collegiate season for some, but for others, the competition proved to be good training for later in the season events like the Summer Olympics. 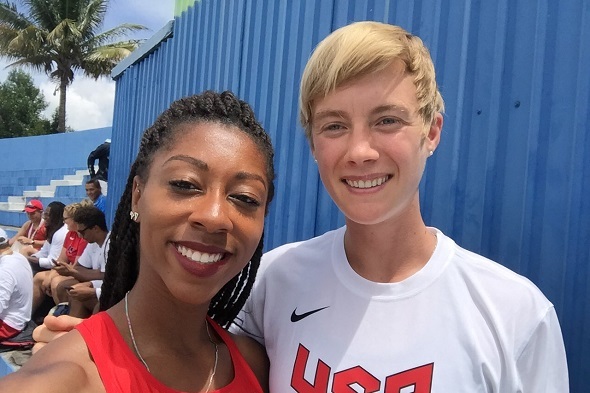 The ninth edition of the North American, Central American and Caribbean (NACAC) championships were held this past weekend in San Salvador, El Salvador. Each HepsNation athlete that competed in El Salvador earned either a silver or bronze medal over the course of the weekend. Sam Mattis earned the first medal for HepsNation in this regional championship, as he was the runner-up in the discus throw (188-04 or 57.40m) on Friday night. USA teammate Brian Williams won with a distance of 58 meters (190-03). 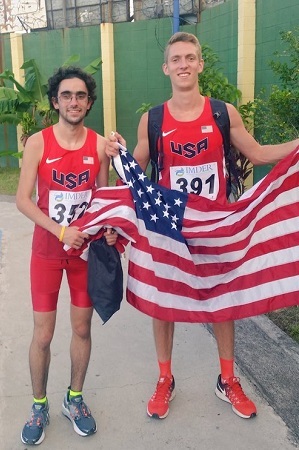 Thomas Awad also earned a medal on Friday night with a third place finish in the men’s 1,500m (3:54.91), almost three seconds back of winner Henry Wynne of Team USA (3:51.81) (right photo – right). HepsNation added two more silver medals to their haul on Saturday. Rio-bound Rudy Winkler finished in second place in the hammer throw. His best distance was 73 meters (239-06) while the winning throw was 74.55 meters (244-07), set by Mexico’s Diego A del Real. del Real and Winkler were the only athletes to throw farther than 70 meters (229-08) in the competition. Paige Kouba battled it out with Canada’s Regan Yee in the 3,000m steeplechase, but in the end, Yee finished steps ahead of Kouba – 10:38.79 to 10:38.84. Sunday action included the latest match-up between Autumne Franklin and Taysia Radoslav in the 400m hurdles. Franklin continued to have a winning record over Radoslav in this event as Franklin finished second overall (56.36) while Radoslav was was fifth (58.78). Radoslav earned her medal in the 4×400 relay, where she ran the lead-off leg for Team Canada. The Canadian team finished third with a time of 3:44.45. At the 30th Meeting Citta’ di Padova, Kyle Merber and John Gregorek were part of a Team USA 1-2-3-4 finish in the men’s 1,500m. Merber ran a new season’s best time of 3:37.35 for second place, while Gregorek was steps back in third in 3:37.58. Erich Avila won in a new personal best time of 3:36.37. At the Heusden-Zolder meet in Belgium, Peter Callahan raced the 1,500m elite race. He finished 15th overall in 3:40.32 while Djibouti’s Ayanleh Souleiman won in 3:31.68. Megan Krumpoch was in the women’s 800m – she finished eighth overall in 2:02.89. Kenya’s Emily Jerotich won in 2:00.45. Sammy Silva competed in her first international event as a professional as she finished sixth in the women’s 5000m in 15:29.89, a little over six seconds back of the winner Renata Plis of Poland. On Friday, Stephen Mozia set a new personal record and Nigerian national record in the shot put at a little meet in Andujar, Spain. Mozia won the competition with a distance of 20.82 meters (68-03 3/4). This entry was posted on Monday, July 18th, 2016 at 10:54 am. It is filed under Alumni, Spotlight. You can follow any responses to this entry through the RSS 2.0 feed.